Spring is finally gracing us with some warmer weather. Over the weekend we had our first taste of real spring weather. 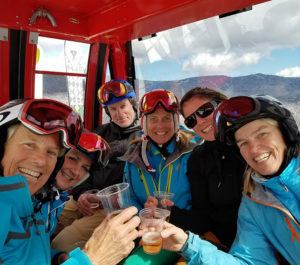 We celebrated by enjoying some incredible spring skiing and lots of tail-gating followed by the first bike ride of the season. As the snow melts and the grass starts to green up, spring cleaning and projects are starting to get into full swing here at the Commodores Inn. Thorough cleaning of all areas inside the Inn are in progress…from carpets, upholstery, windows etc…One of our bigger projects planned for this spring is replacing the deck in the back of the Inn overlooking our 3 ½ acre lake. Spring is a wonderful time to visit us. There is still plenty of snow in the upper elevations for all spring skiing enthusiasts. The warmer weather also is bringing on many warm weather activities such as hiking, biking and kayaking. April is known for its rain showers which we welcome as it helps with the spring clean-up and green up! There are plenty of things to do in the area if the weather is inclement while you are here. Here are some great upcoming events which you may want to plan on. We have had an amazing winter in Stowe with bountiful snow for most of the season starting before Thanksgiving. Finally though we are just beginning to feel the effects of spring which is just around the corner. The spring birds are filling the air with their beautiful song. The sunshine is higher and brighter, the days are getting longer and have a hint of sweetness in the air as the sap begins to flow. This first warmth is bringing on some amazing spring like skiing and riding. There are some classic spring events coming up. Our annual Retro 80s celebration will be held on March 22-24th. It is be perfect time to celebrate the 80s in your neon one piece suits and mullets. The annual Sugar Slalom is celebrated with a Mardi Gras atmosphere along with sugar on snow, donuts, pickles, BBQ & music. It will be celebrated on April 6 and 7. Please check the links below for all spring event information. Summer has arrived and it is time to make your plans for your family vacation. 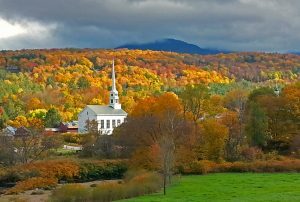 There is a ton to do here at the Commodores Inn and Stowe, Vermont. Our 3 ½ acre lake is in tip top shape with new docks and new bulk head. We have canoes, kayaks, row boats and fishing available for anyone to try. The outdoor pool will be open until early September and the heated indoor pool and hot tubs are open year-round. Our gardens are in tiptop shape ready to welcome you upon arrival. 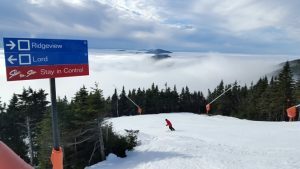 Please check https://www.gostowe.com/events/ to see the endless list of things to do. Some activities that you may want to enjoy are hiking in our beautiful green mountains, biking along our beautiful roads or our recreation path which meanders along the valley floor or mountain biking on our endless network of trails which include smooth newly made trails as well as more technical old style trails. Winter is going strong here in Stowe. The storms just keep on rolling in. We have gotten 25 inches in the past 7 days which has made the skiing and riding is absolutely amazing. There is something for everyone from packed powder on freshly groomed cursing terrain to soft powdery untouched side country and back country terrain. All of the Nordic Centers are open with perfect packed powder tracks for classic skiing and plenty of open terrain for skate skiing. There are many trails for snow shoeing as well. Umiak Outfitters, which is right beside the Commodores Inn, has an endless list of activities for all kinds of enthusiasts such as Dog Sledding, Ski Tours, Sledding Tours, Fat Bike Tours, Stowe Tasting Tours etc. Stowe Snowmobile Tours is also located at Umiak Outfitters which provides endless possibilities for snowmobiling in the area. 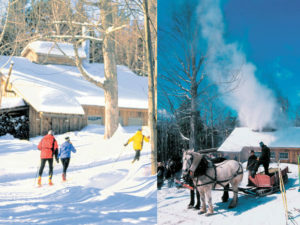 Mid-winter is the perfect time to plan your trip up to enjoy our amazing array of winter activities. Just to name a few. We are looking forward to welcoming all of our guests who would like to enjoy some world class leaf peeping.